Conceptual design depicting future urban flood protection solutions for Manhattan – Image courtesy of BIG-Bjarke Ingels Group. New York — Arcadis was selected as Engineer of Record for the Federal Emergency Management Agency (FEMA) flood protection multiphase design of New York City’s East Side Coastal Resiliency (ESCR) Project in the borough of Manhattan. Arcadis is part of a team supporting New York City’s efforts to safeguard the Lower East Side against severe weather events and continued sea level rise. The ESCR Project, led by the Mayor’s Office of Recovery and Resiliency, is an urban flood protection solution spanning 2.5 miles of Lower Manhattan, including the East Side, and is the first element of coastal storm and sea leave rise defense system for the East Side and Lower Manhattan. Hurricane Sandy devastated coastal zones and low-lying urban areas of New York City, and Manhattan’s economy suffered during and after the storm. Neighborhoods, businesses and underground transportation systems flooded and the New York Stock Exchange closed for two days. Hurricane Sandy brought to the forefront New York’s vulnerability to coastal flooding and the need to improve its resiliency to severe weather events. In collaboration with the City of New York and local communities, Arcadis will design flood protection solutions that merge into the urban fabric for 200,000 residents and 21,000 businesses. As the five-year anniversary of Sandy approaches, these solutions will strengthen coastal defenses and improve community enjoyment of existing parks while offering future flood protection and environmental benefits. Arcadis will also develop supporting documentation necessary for changes to FEMA flood hazard maps. 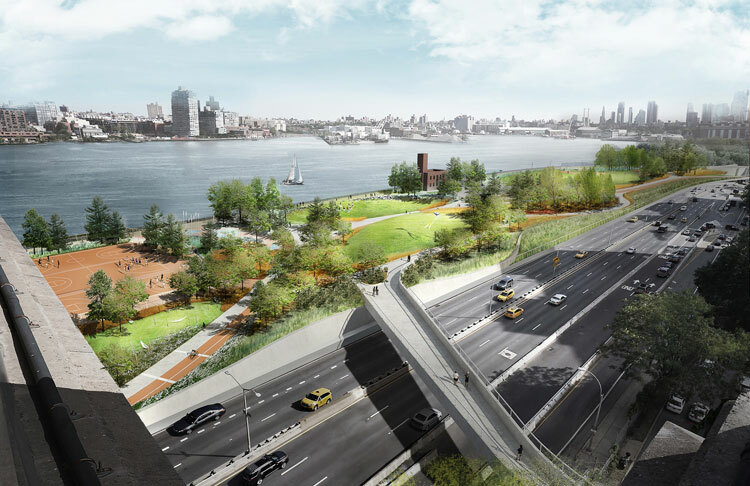 Design features will incorporate a combination of architectural floodwalls, bridging berms, embankments, moveable floodgates, and interior drainage improvements, all integrated with East River Park amenities to include recreational facilities, pedestrian and bicycle pathways. Arcadis has undertaken many high-profile water management and resiliency planning projects throughout the U.S., including Hurricane Harvey response in Houston to support damaged or at-risk commercial, industrial or public-sector facilities, the assessment of San Francisco’s Mission Creek, and reducing risks to communities in Norfolk, Virginia, against severe weather events via an enhanced flood protection system.